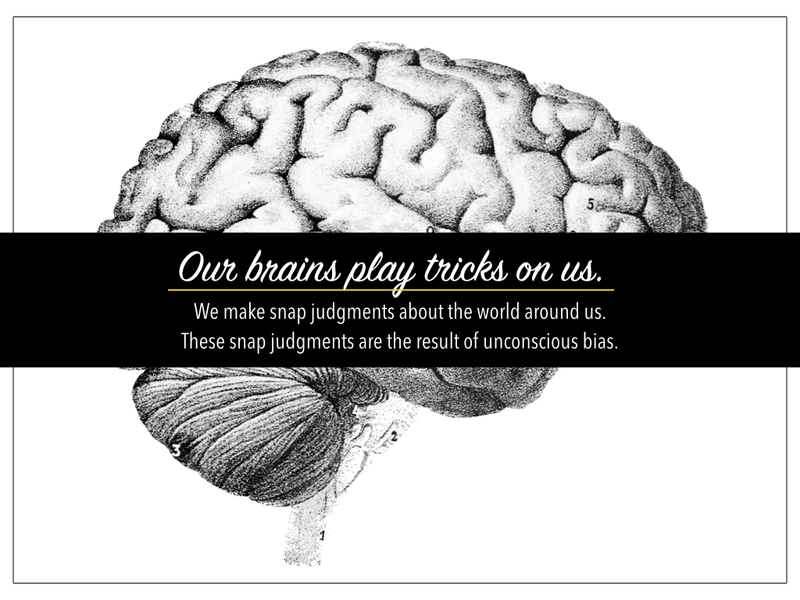 The ‘Design for Worldview’ toolkit is a package of exercises, activities and insights that center around a core thesis: We all have unconscious bias, and we are all creative. 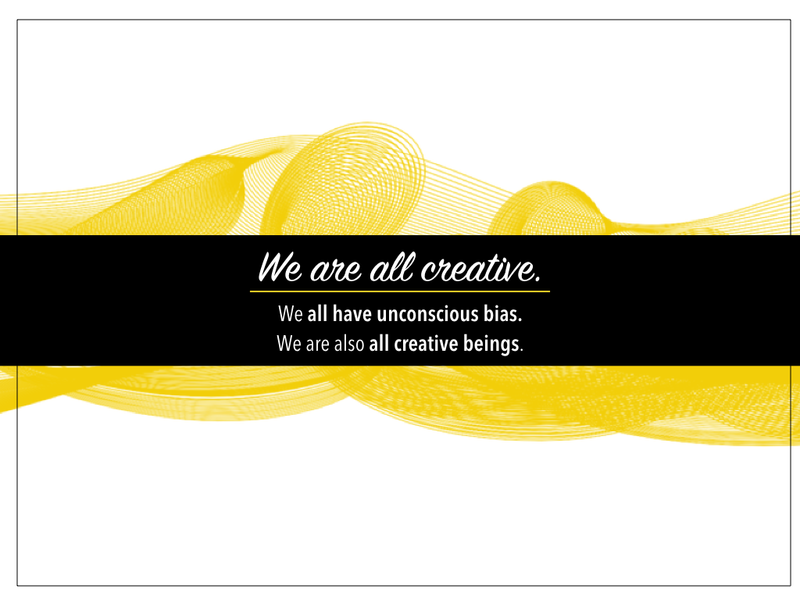 How might we use our creativity to disrupt our unconscious bias? These biases can lead to both good and bad outcomes. They can help us make decisions that preserve our survival. They can also lead us to form homogenous teams, perpetuate harmful stereotypes and create products and publications that disadvantage or leave out large swaths of the population. Earlier this month, messaging app company Snapchat released face filters that allowed millions of users to perpetuate blatantly racist stereotypes. The filters were eventually deleted amid a storm of criticism. Unfortunately, this is not the first incident of racial bias and stereotyping in media design, and it is all but certainly not the last. The critical thing to remember is that everyone has these biases. There are no exceptions. The question is: What do we do about them? The rise in interest among for- and non-profit organizations around both areas of education and training — unconscious bias awareness and design thinking — creates a unique opportunity in the organizational training and education marketplace. More importantly, unconscious bias and design thinking naturally go hand-in-hand, much as media and design do. Both areas of training help people understand the power of assumptions and empathy and help them navigate the challenges of team dynamics among diverse individuals. The two also diverge in a very important way. Unconscious bias trainings can produce a negative reaction among attendees. Members of marginalized groups may be made to feel further marginalized, while those of majority population groups may tend to feel blamed or shamed for transgressions they unknowingly committed or may have never committed. I call this the “blame-shamey response” or “The Cringe”. Participants in unconscious bias learning experiences are exposed to the difficult fact that unconscious bias is universal. Often and unfortunately, participants are then left with little to no sense of agency to do anything about it. Design thinking trainings, on the other hand, are all about taking action. They leave people feeling empowered and ready to act. They are generally upbeat, high-energy and colorful learning experiences that teach people how to grow their creative potential and “bias towards action”. This message of universal creative capacity and the skills associated with design thinking can be viewed through myriad lenses and turned on nearly any project, but it is often viewed as a means by which to create products, services or experiences. ‘Design for Worldview’ pairs the important tools and empowerment of a design-thinking learning experience with the important challenge of raising unconscious bias awareness. 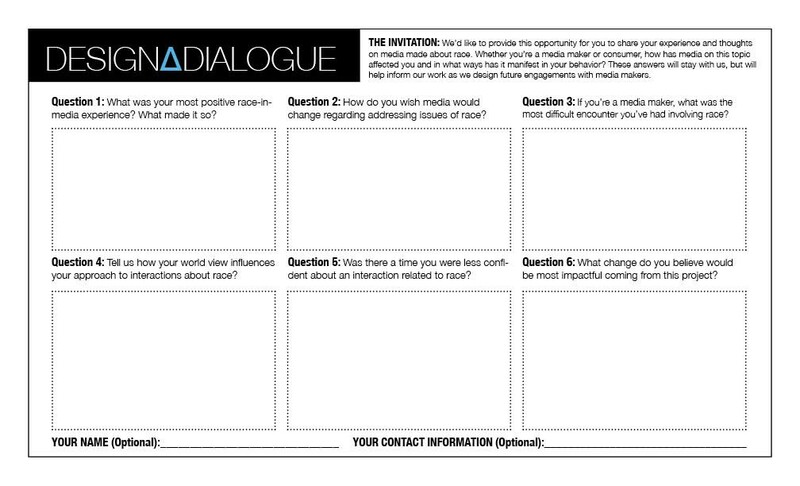 Those in media and design share a critically important challenge: how to grow diversity, equity and inclusion both in their ranks and through the products and services they offer. Other fields face this challenge as well, but these two fields were my charge as a member of the Media Experiments team at the d.school. 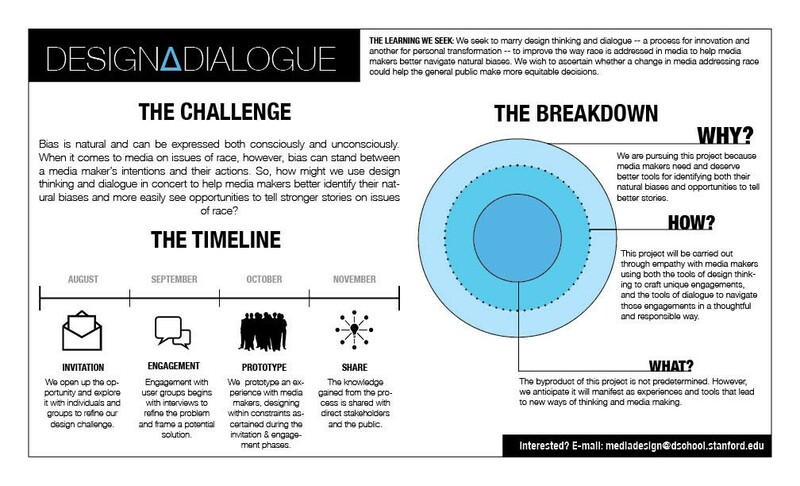 It should come as no surprise that media and design share this challenge, since the two are entirely interdependent. There is design in media, just as there is media in design. Practitioners in both areas have an incredible amount of influence over our society and culture. The stories we tell influence the products we create and the ways in which we treat one another. Those products, in turn, help shape our cultural narrative and determine access and opportunity for everyone. Science fiction priming, for example, influences the path of consumer technology innovation (smartphones and driverless cars), just as the editorial choices in newsrooms influence what we dismiss and value (press coverage of politics and crime). It is imperative that the people empowered to make these decisions are diverse, that the organizations in which they work are inclusive and that the way they are treated is equitable. 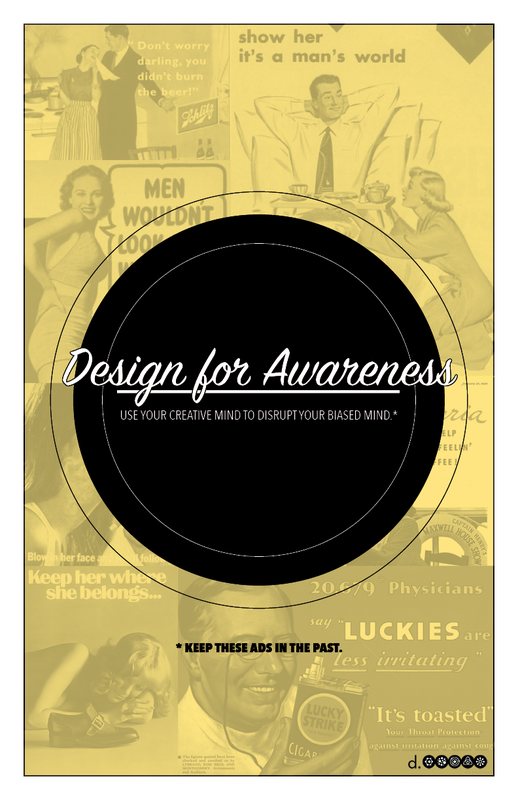 The ‘Design for Worldview’ cards, which are meant to be used on an as-needed basis. The work of growing diversity, equity and inclusion in design and media is an ongoing challenge. Design firms have historically struggled as have traditional or mainstream media companies. Silicon Valley tech companies, many of which rest at the latest intersection of media and design, continue to struggle when it comes to recruiting diverse talent and maintaining equitable and inclusive work environments. It was unfortunate incidents like this that led me to pursue a career in media production. If I knew how the decision-making and technological processes worked in major media organizations, I could bring greater diversity to the various fields. Or so I thought. Close to a decade later, I realized that working on two fronts was much harder than I had imagined. The deadline demands, the intricacies of the production process and the sheer attention to detail necessary to pull off a weekly television show, publish a newspaper or produce multiple blog posts a day can easily distract from the opportunities to raise awareness — to say nothing of the persistent financial challenges faced by many media organizations. In an effort to discover creative solutions to entirely new and changing problems, media executives are beginning to adopt design thinking methods, modes and mindsets beyond their formal design departments. Journalists, editors and media executives are engaging in introductory design thinking experiences in an attempt to learn and spread design thinking throughout their organizations. It became clear to me that a new kind of design thinking learning experience that addressed unconscious bias might help bring positive change to both the media and design arenas, broadening the learning and teaching opportunities for both media makers and designers as well as other professional areas. As I was working my way towards this thesis, I crossed paths with Amy Lazarus, the CEO and Founder of Inclusion Ventures, which offers a suite of services to help organizations grow diversity, equity and inclusion. Prior to founding Inclusion Ventures, Amy also served as the executive director of Sustained Dialogue Campus Network before becoming the executive director of its parent organization, the International Institute for Sustained Dialogue. In the interest of full disclosure, I have known Amy for years as a fellow member of the World Economic Forum’s Global Shapers initiative. But it was Amy’s expertise and perspective that made her the collaborator I needed. She was someone with relevant expertise and a perspective on both design thinking and unconscious bias that differed from my own. Our project was originally called Design∆Dialogue. This is the front page of a brief we distributed to members of the extended d.school community. On the back of the brief was a questionnaire to prompt inspiration. Our process continued throughout the year with encouraging highs and frustrating lows. I chronicled much of it here, here, and here on Medium and on my portfolio site ‘Para∆igm’, which became ‘Para∆igm 2.0’, following the addition of new learning experiences, tests and prototypes. This final version of the experience looks different from our original and is the result of a number of iterations. It was built on the feedback both inside and outside of the d.school we received as we ran and tested its various components. The experience exists on multiple levels. 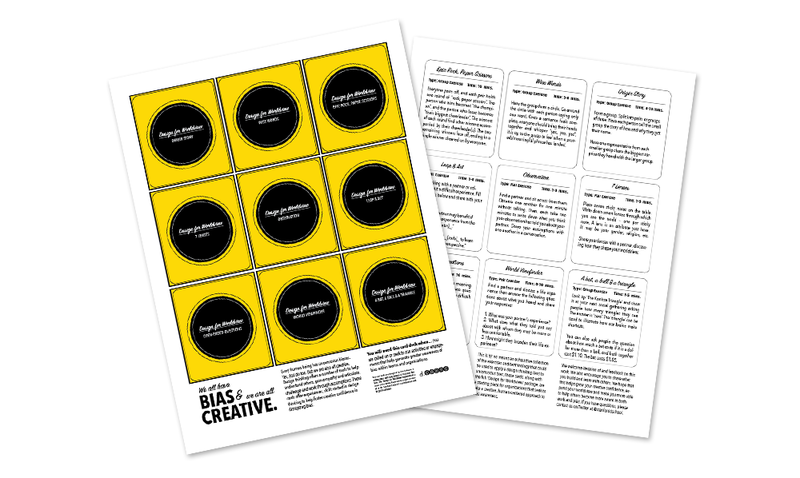 There is a card deck of activities and skills that can be engaged in independently, a full workshop participants can run and posters organizations can use to spread awareness of the potential for design thinking and creative problem solving to disrupt unconscious bias when it may lead to negative outcomes. 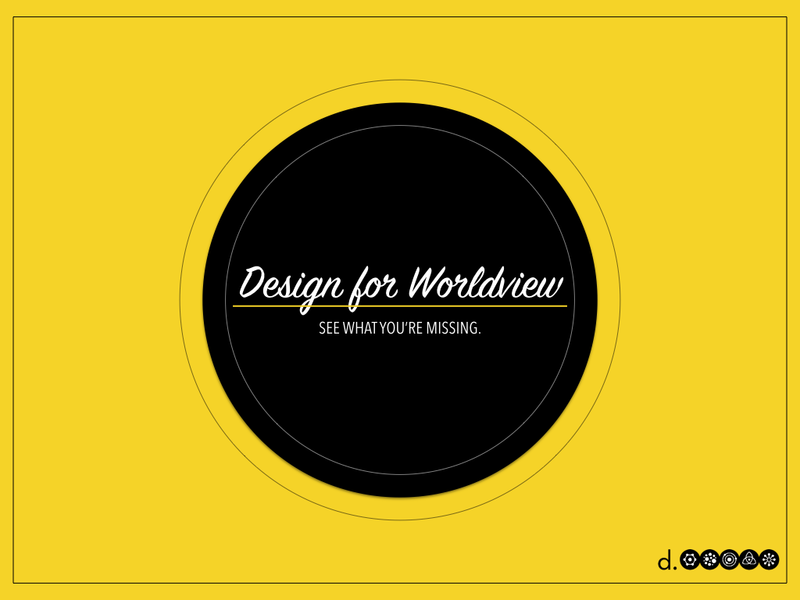 Ultimately, however, ‘Design for Worldview’ is an invitation. Much like design thinking process maps and mindsets, it is not meant to be taken as gospel. 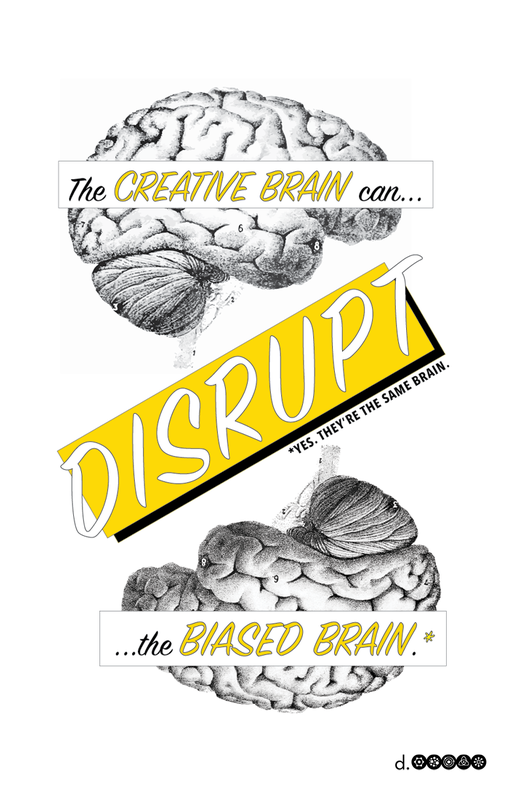 It is, instead, an opportunity to change your worldview about design thinking and unconscious bias education and to create and iterate in the wake of that paradigm shift. These files are a springboard for anyone to develop a design thinking learning experience that not only helps people create great products, but also helps them foster a more diverse, inclusive and equitable world. The ‘Design for Worldview’ experience was developed at the Stanford d.school by Emi Kolawole in collaboration with Amy Lazarus of Inclusion Ventures, and was funded by Knight Foundation. You can download the full experience here.